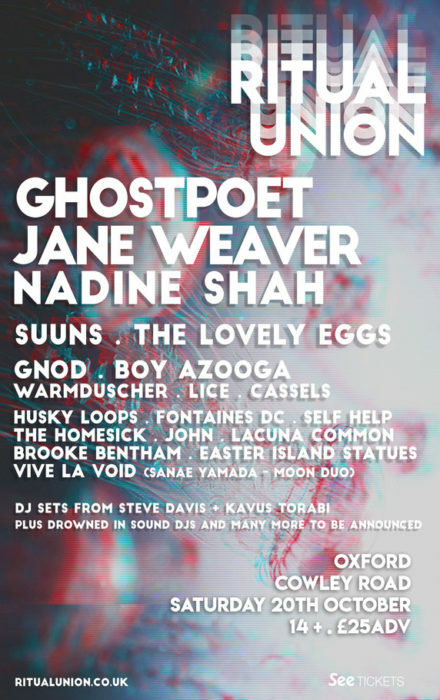 Held across multiple venues on Oxford’s vibrant Cowley Road, the second edition of the Ritual Union Festival has just announced an amazing line-up including Ghostpoet, Jane Weaver, experimental jazz soloist Nadine Shah, Canadian Krautrockers Suuns and many more. Following the huge success of the first Ritual Union Festival held last year, The O2 Academies 1 & 2, The Truck Store, The Bullingdon and The Library will play host to this year’s ambitious event, offering the chance for local music fans to congregate and enjoy a stellar line-up of live music. A short journey from the city centre, the festival also enables travellers to enjoy the famously historic Oxford and its beautiful surroundings and the lively atmosphere of Cowley Road itself. The impressively diverse line-up is a showcase of talent from around the world, while staying true to the festivals ethos of promoting upcoming home-grown artists. Heavily involved in the areas already thriving music scene, the festival is above all a celebration of young bands, fittingly held in the city famous for producing such legendary talent as Radiohead, Swervedriver and Ride. This first batch also includes the likes of Heavenly Records up-comers Boy Azooga, psych-rock duo The Lovely Eggs, ambitious politi-punks Gnod and Fat White Family and Childhood post-punk super group Warmduscher, with more bands to be announced very soon.